As much as I haven’t been ready for the cooler temperatures that suddenly dropped in the Downingtown area, I am really digging them! They’re an excuse to break out pants and sweaters and fleece jackets and throw blankets and actually use our duvet and drink more coffee and tea. Unfortunately, it also means I had to bring in my poor little herb garden (see previous post) from the cold so that it wouldn’t wilt and die! I hope the herbs like their indoor environment as much as they liked their outdoor one. It’s been fun looking back on last October — last year Dayne and I went with Dayne’s parents to Gettysburg right as the cooler weather was setting in. We also went to Highland Orchards and got waaaaaay too many apples; we had applesauce, apple pie, and apple crisp for at least a week. We hosted a bonfire at Dayne’s parents’ farm where we ate s’mores and drank cider and Dayne even appeased me with a “hayride”. We joined Dayne’s friends for a weekend at a cabin in central PA where we visited the Pennsylvania Grand Canyon and ate chili and played games. 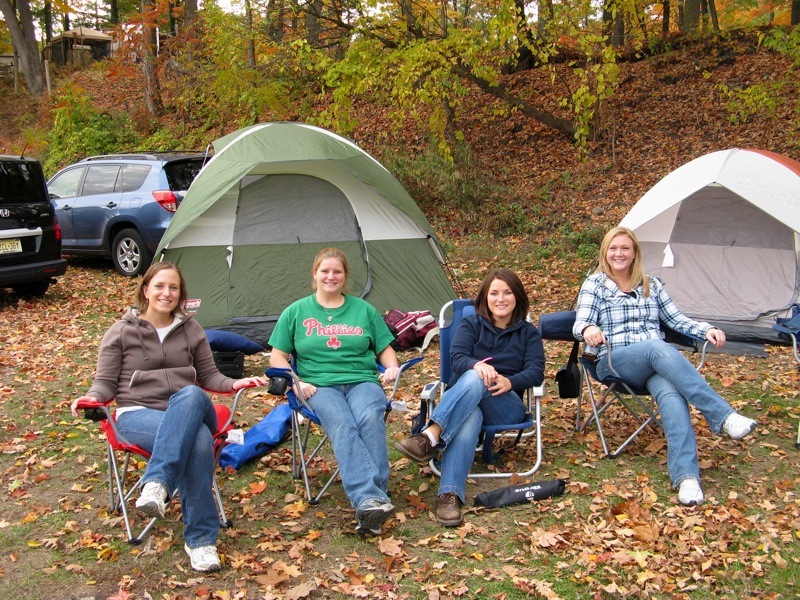 My friend Jess came to visit all the way from Utah and we went with some best friends to northeastern PA for an overnight camping and rafting trip to celebrate Erica’s 25th birthday. It was a busy and VERY fun month! 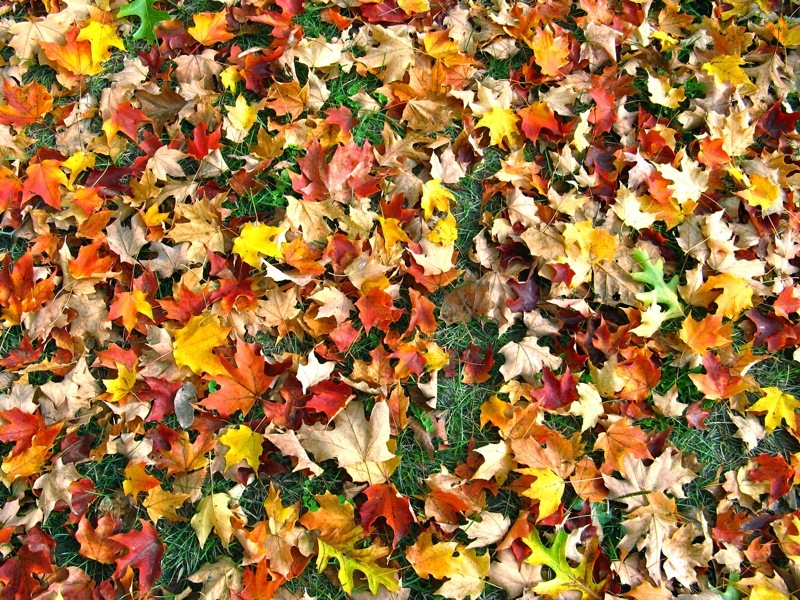 If you have any favorite fall recipes or activities, please leave them in the comments! 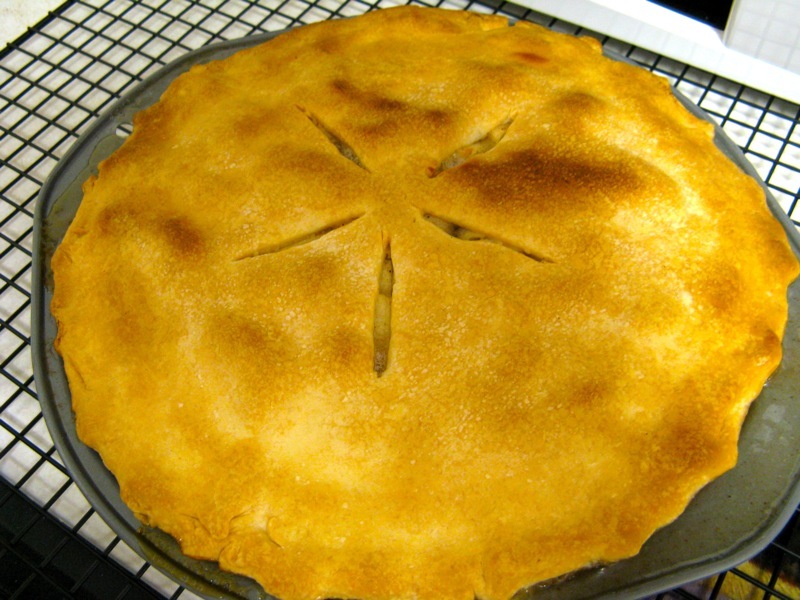 Categories: Dayne, Fun with Friends, Looking Back, Random Rants | Tags: apples, autumn, baking, camping, changing leaves, Dayne, Erica, fall, friends, Jess, leaves, mountains, poconos, pumpkins, recipes | Permalink. The Dayne & Lisa Cooking Show. 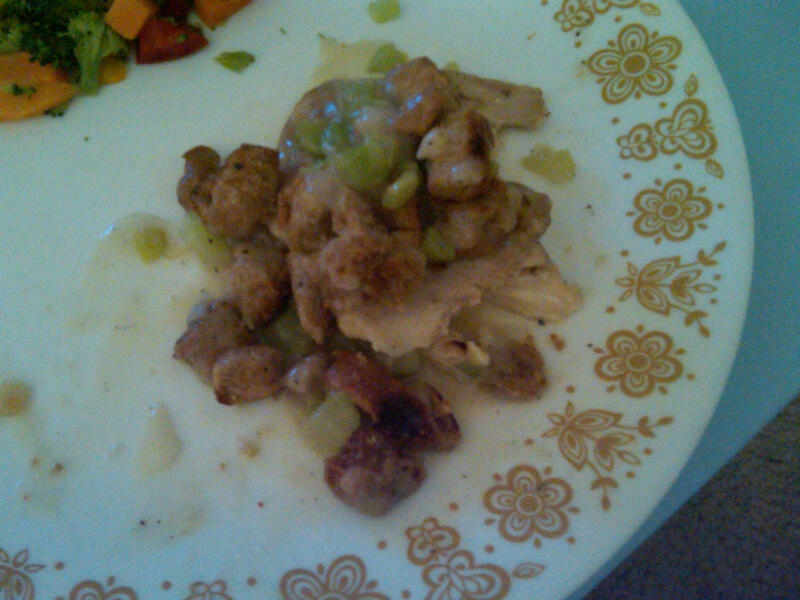 Last weekend we made Stuffing-Topped Chicken from Eating Well on a Budget. Turns out the “budget” part isn’t necessarily true unless you’re feeding a family of four or you’re really good at eating leftovers. This was probably the most difficult recipe I’ve ever followed, and our least favorite part (which Dayne did most of) was trimming the fat off the chicken thighs. I’d much rather use chicken breasts, but I’m not sure how that would turn out. 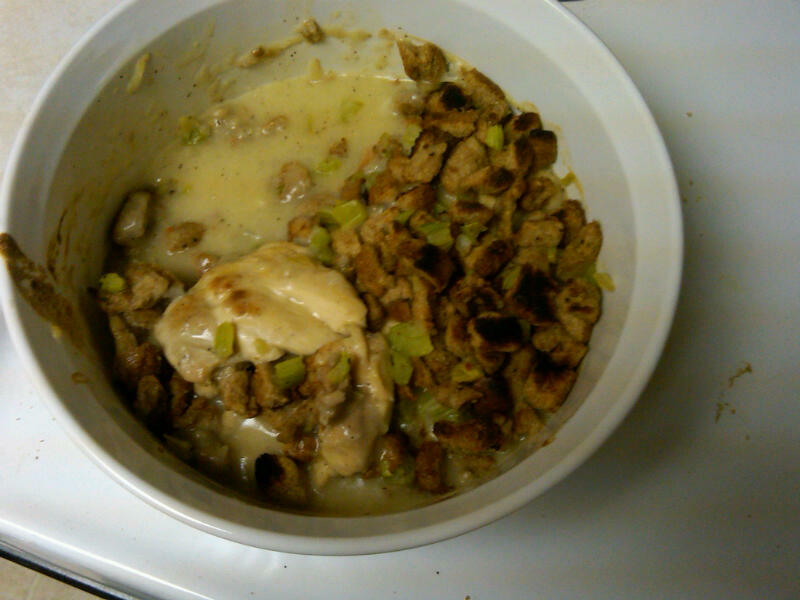 Here are a couple of pictures — it LOOKS disgusting, but it was delicious. The best decision we made was omitting mushrooms and substituting extra onion; the celery and whole wheat bread really added to the taste. p.s. This was also my first time using the broiler, and for a brief second my oven mitt burst into flames when I went in to get the chicken. That was exciting. 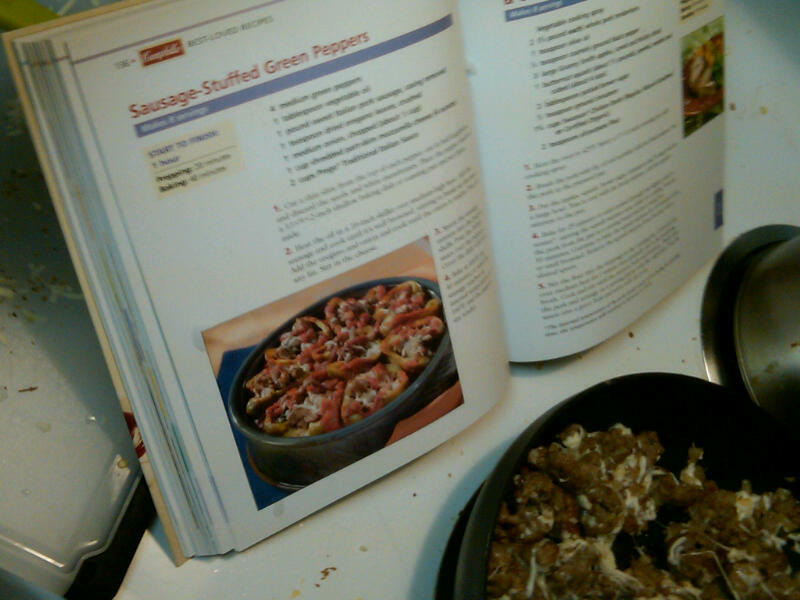 Then this past Saturday night, we discovered a little gem in the Campbell’s cookbook: Sausage-Stuffed Green Peppers. Yum! Dayne has become designated Raw-Meat-Handler, so he got the job of removing the casings from the sausages. Again, this wasn’t the cheapest dinner to make unless you’re feeding a family of four, and this is not a good “leftovers” meal (I’m still recovering from eating it for lunch today). It was super-easy, though, and the presentation is pretty. 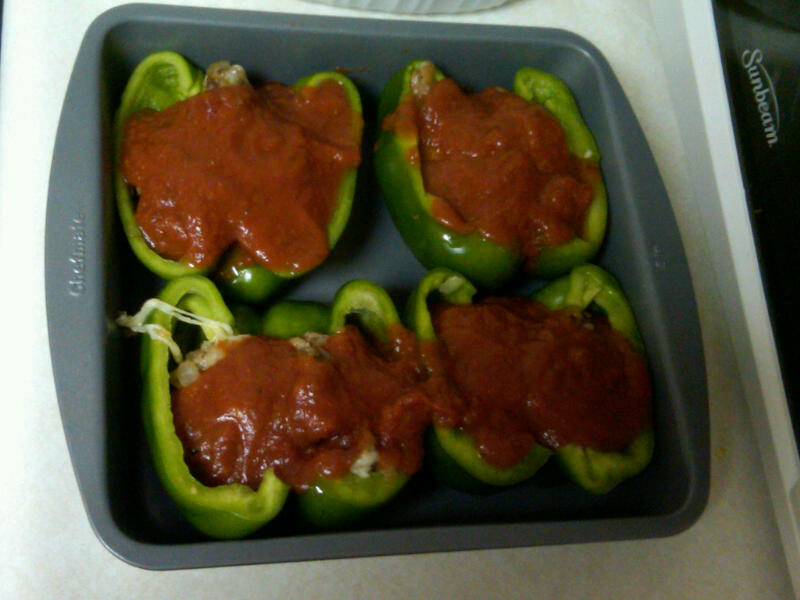 It’s basically sweet Italian sausage, oregano, mozzarella cheese, tomato sauce, and, obviously, green pepper. I liked this one a lot; however, Dayne was a bit disappointed with the taste & consistency of the green pepper after it baked in the oven for 40 minutes. Categories: Cooking & Baking | Tags: campbell's best-loved recipes, cooking, dinner, eatingwell on a budget, recipes, sausage-stuffed green peppers, stuffing-topped chicken | Permalink.